The festive season is over, but retailers still have bad hangovers. In Delhi, despite shopkeepers offering over 30 percent discounts (the same as the previous year), Diwali sales were down 15-20 percent. Until early December, sales were 20-25 percent less than 2010, but by end-December it picked up a bit. 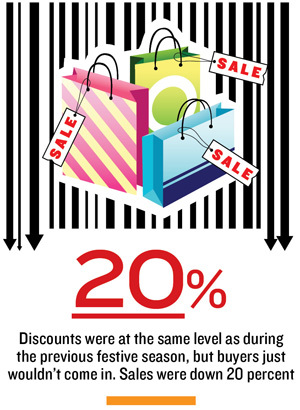 In Mumbai and Bangalore as well, large-format retailers have a fixed schedule of their discount seasons. That timeline has not changed, but sales have dipped approximately 20 percent, so much so that smaller players felt the need to hit the sale season right after Christmas Day to keep up with the large format retailers. It is a very different scene from last year where the same period saw 20-80 percent spurts in gold, electronics, and clothing sales. Looks like whispers of a second recession are making people tighten belts and purse strings.